These pictures were taken last February when I had my normally winter garaged Amazon on the road for one month. 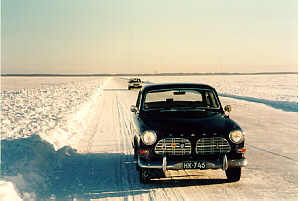 Having started my Volvo career in a brand new 740 GLE ten years ago I had no experience on winter driving an old Volvo. My wife's 1987 240 GL does not qualify as an old car in this respect either! So we decided to wait until the temperature settled to constant sub-zero state and there was no more salt spray on the roads and then see how our classic would perform. The date when we drove to the garage to take the Amazon for a spin for the first time was just normal February in Northern Finland, i.e. about -17 degrees C, clear sky, icy roads and about two feet of snow on the roadside. We had heard the legends of warm old Volvos but the performance of the heater was still a positive surprise. The test trip was to be about 40 miles to my parents, with my wife, myself, and our two sons on board. The car hibernates in a warm, almost room temperature garage. So we just changed our winter clothes from the boot of my wife's 240 to the boot of the Amazon, locked the 240 in the garage for the weekend and off we drove. The windows starting getting misty fairly soon but the car was nice and warm despite the coolest available thermostat to protect the engine in a car which is normally driven in summer only. 30 miles later on I found a good setting of the vent controls and got some side window visibility too! When seeing our transport my mother was worried for the boys getting flu in such an old heap. Our older son (age 6) explained her that he did not want to wear his overcoat at all, the car was started from a warm garage anyway! Off the coast of the town of Oulu in Northern Finland there is an island named Hailuoto. In summer time all traffic is by two ferries but in wintertime when ice is strong enough there is a public road ploughed on the sea with a weight limit of 3 tons, if my memory serves me correct. This ice road is some 5 miles long and the pictures have been taken almost half way across. Due to the weight limit all buses and HGV's must still use the ferry connection which is operational also in winter less than half a mile away. And before John Smith comments on it, I admit that the hubcaps are of the wrong type. The reason is that I have got no winter tyres for the Amazon and I had to borrow a set from a friend of mine. The wheels were nicked from his Duett, of pre-65 model, so that is why I had to use an old set of hubcaps too. Our car is 69 model and so the grilles, bonnet without chrome (actually aluminium?) trim and chrome VOLVO letters on it are correct This must now be pretty much and old story for at least a number of members from the Nordic countries but I tell it anyway. 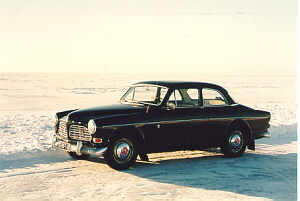 Compared to our newer rear wheel driven Volvos (240, 740) the chances of getting stuck in snow seem higher. This is partly due to old winter tyres. These have improved dramatically over the years. Also the smooth clutch action and plenty of torque at low revs in a newer GLE make the drivers job a lot easier. I've never tried a 300 in really slippery conditions, having the gearbox at the rear should actually make it quite good for winter. Any comments here? The steering becomes much lighter which is only positive compared to an Amazon in summer. On icy roads the car needs to be "driven" all the time, it is not as stable as a 740 but it is by no means all over the place either. Surprisingly powerful (H4) headlights and smooth power brakes make a late Amazon a driveable and safe car also in winter. The driver may not be as relaxed as in a newer model but on the other hand one certainly knows what is happening between the wheels and the road at all times. The biggest drawbacks in my opinion are when starting from cold. There was no trouble getting the engine started, as I never tried to start it without preheating first. But the windows take ages to clear from ice if they ever clear at all, and those plastic seats with no electric heating feel really cooool!